B&C B&C-BAG-COSMETIC-02-POL-LL-0500-001 - Versatile and multifunction travel cosmetic organizer: large outside pocket holds a lot of additional items for easy access when the bag is closed. Many bags come with transparent pvc pockets - very easy to see-through and grab! Choose your Versatile Travel Cosmetic Bag from the following list: Versatile Travel Cosmetic Bag - Hanging Toiletry Organizer 10"x7. 5"x4. 5" - perfect hanging toiletry bag for small toiletries and many other thins; Large Clear Cosmetic Case12"x9"x4" - the ideal travel bag for full-sized toiletry bottles; Small Clear Cosmetic Case8"x6"x2" - specially designed to use in carry-on luggage. Make your own set of bag&carry travel bags in polka-dot style! visit our gria lifestyle seller shop and choose the other useful Bag&Carry travel bags, designed to make your life easy and comfortable while traveling - so why not try the set to cover all your needs? Cute Travel Makeup Bag Large Travel Bra Organizer Large Travel Tote Bag For Moms Any friend or relative would love to have this as a gift, whatever the occasion. Large Versatile Travel Cosmetic Bag - Perfect Hanging Travel Toiletry Organizer XL Polka dot - This nice looking and very practical makeup bag comes with: comfortable top carry handles, practical, top zip closure, three large transparent zippered compartments, one front big size zippered pocket, and one, detachable pouch and steady metal hanger.3. Make sure you always have everything you need when travelling! versatile travel cosmetic bag from Bag&Carry - a MUST HAVE gear for any active traveler! Keep all your cosmetics, grooming, makeup, toiletries and travel accessories very well organized! In the product range of Bag&Carry Travel Cosmetic Bags you can find all necessary bags and cases to arrange your trip comfortable and organized. Comes with included set of 4 silicone travel bottles 3oz each ; All bags come with: comfortable top carry handles; sturdy hanger and durable material - polyester 600; bright and reliable pink zippers; waterproof lining; made in cute polka-dot style. Real large size hanging travel makeup bag: 12" x 9" x 4" with practical design. B&C B&C-BAG-COSPOUCH - This is a is a great addition to large travel cosmetic bag and large travel bra organizer by bag&carry! MAKE YOUR OWN TRAVEL SET AND GO TRAVEL! Perfect cosmetic pouch for everyday use: Practical shape with large space for all your 1000 trifles. They are a great and classy way to store your cosmetics, toiletries and other belongings. Toss it into your purse, backpack or gym bag! . It will match all your expectations! Travel made easy: toiletry and cosmetic bags from Bag&Carry are must have for all active travelers and an ideal gift for your family and friends. Well made and durable materials: this exceptional cosmetic makeup bag is made of sturdy, high quality 1680D polyester, waterproof nylon lining, and tough zippers. Large Cosmetic Pouch - Travel Organizer For Your Cosmetics - Versatile Travel Makeup Bag - Optimal size and great design: 9" x 3. 5" x 3. 5" this makeup organizer comes with one main zippered compartment to keep your cosmetics, to keep your glasses, which can be wide opened for easy access, jewelry or discreet items and two side compartments, other essentials and even iPhone8+ size telephones. Versatile and multifunction cosmetic bag to make travel easy and comfortable: You can keep all your cosmetics and accessories in one organizer and just move it from you everyday bag to your backpack or gym bag - no needs to look and move all your items, when you change the bag! Large cosmetic pouch by b&c - a must have when travelling! Keep all your cosmetics, makeup, grooming and accessories organized all the time. YAMIU SBZ-4P - Toss it into your purse, backpack or gym bag! Not like other shoe bags will be too big or too small, 2 perfect right choices for you or for your family to choose according to your needs. Right sizes for Choices: Set of 4. Keep your shoes separated from clothes in the luggage during the trip. 2 standard sizes9"L x 4. 7"w x 9. 8"h, fit for shoes under size 10, sneakers, lady casual shoes, like lady High-heeled Shoes, heels, etc. The center zipper design makes it easy to get items in and out. High quality & lifetime warranty】 Quality guaranteed. Waterproof function. Lifetime guarantee: yamiu strive to provide you with the high quality shoe storage bags at affordable prices with LIFETIME GUARANTEE. YAMIU Travel Shoe Bags 4-Pack2 Sizes Waterproof Nylon with Zipper for Men & Women Black - Great for travelling, or for keeping your shoes dust free in the closet. Also great for keeping your favorite shoes from getting dusty in the closet! ☆ Durable & Easy to clean: • Superior nylon fabric: Made up of high quality Nylon. Unconditional lifetime warranty for any shoe bags with quality issues. Due to different camera, light environment and display, the physical color will be a little different from pictures. They are a great and classy way to store your cosmetics, toiletries and other belongings. Pierre LaCroix - Perfect cosmetic pouch for everyday use: Practical shape with large space for all your 1000 trifles. Standard size: 9"L x 4. 7"w x 9. 8"h, great kids shoe storage bags. Waterproof material】nylon fabric. They are a great and classy way to store your cosmetics, toiletries and other belongings. Great for travelling】good design for home and travel use. Also can store 2 pairs of kid shoes, fit for shoes under size 10 Lightweight and does a perfect job of packing shoes and keeping everything else clean. Plus, the bottom pocket is detachable in case you just want to bring a few essentials with you when traveling instead of the whole bag. Waterproof function. The Biggest F'n Toiletry Bag On Amazon 42”x14” | For Men and Women | Leak Proof | Clear Pockets | Detachable Compartment | Makeup Bag | Cosmetic Bag | Black - You are also covered by Amazon's 30 day return policy if you're unhappy for any reason. Also functions as a travel makeup bag or cosmetic bag - need something for your make up and other cosmetics as well as your toiletries? Don't spend money on a separate makeup organizer bag when you can fit all you need for travel right in here. Also functions as a travel makeup bag or cosmetic bag - Need something for your make up and other cosmetics as well as your toiletries? Don't spend money on a separate makeup organizer bag when you can fit all you need for travel right in h. Great shoe bags for dancing, tennis, golf, playing basketball, for gym and so on. Strong zipper】specialized custom-made zipper with high quality smooth zipper teeth, zips up smoothly and durable. SAFARI Travel Bags - Standard size: 9"L x 4. 7"w x 9. 8"h, great kids shoe storage bags. Waterproof material】nylon fabric. Waterproof: the waterproof and leak proof fabric means that you don’t need to worry about accidental splashes or spills because you can just quickly wipe the area with a cloth and it will easily dry with no hassle. Perfect cosmetic pouch for everyday use: Practical shape with large space for all your 1000 trifles. Waterproof function. No more having to buy numerous bags to fit all your essentials. Versatile: the 3 clear compartments make it easy for you to spot what you need instantly and the easily detachable zippered pouch is useful to keep those products you want to take separately. Spacious: most toiletry bags are too small to fit all of your toiletries, especially if you are going on a long trip. Beautiful: we placed just as much emphasis on the look and feel of this bag as the function of it as we want our customers to use it for many years to come. The outer pocket allows for easy access of even more products so that you can stay organized. Comes with Drawstring Bag - The Perfect Gift - Large Hanging Travel Toiletry Bag for Men and Women by SAFARI Black- Durable Waterproof Nylon Organizer with Clear Compartments and Detatchable Pouch - 100% satisfaction guarantee; our travel toiletry bag is backed by our manufacturer 30 days money back guarantee. Great shoe bags for dancing, tennis, golf, playing basketball, for gym and so on. Strong zipper】specialized custom-made zipper with high quality smooth zipper teeth, zips up smoothly and durable. Spacious and stylish; it is large enough to fit even your full sized shampoo bottles and all your travel essentials in one bag so there is no more need to waste money on buying multiple bags and cases. D&D Wanderlust - We get approached all the time by happy customers who got a second one for their partner, while camping, on a long-term backpacking trip or at an overnight stay in a hotel. Experience it once, and you'll never want to travel without it again. It is also waterproof so that you can easily wipe down leaks and spills. With all the compartments in this hanging toiletry bag, staying organized is a breeze. Lightweight and does a perfect job of packing shoes and keeping everything else clean. No longer will you have to buy those tiny travel bottles, because this bag is large enough to fit your favorite everyday toiletries. Hang Case for Cosmetics and Toilet Accessories with Metal Swivel Hook - Designer Travel Organizer for Makeup and Toiletries for Men and Women - D&D Hanging Toiletry Bag - At d&d quality is a top priority and all our hanging toiletry bags are designed with care and built to last. Stay organized with 5 separate compartments; 2 large clear compartments 11. 8"x8. 2"x2. 3", 1 medium clear compartment 10"x7. 2", 1 detachable pouch 9. 4"x6. 6" and 1 outer pocket 9. 8" x 6. Bag&Carry B&C-BAG-COSMCASE-01-WPD-LL-0500-001 - Stay organized with 5 separate compartments; 2 large clear compartments 11. 8"x8. 2"x2. 3", 1 medium clear compartment 10"x7. 2", 1 detachable pouch 9. 4"x6. 6" and 1 outer pocket 9. 8" x 6. 6". It will match all your expectations. Travel made easy: toiletry and cosmetic bags from Bag&Carry are must have for all active travelers and an ideal gift for your family and friends. X-large size: 9"L x 4. 7"w x 12. 2"h, 2 standard sizes +2 x-Large sizes= Perfect size for both lady shoes and man shoes. We only use the best materials available, including PREMIUM YKK ZIPPERS and top-quality waterproof nylon. Lifetime guarantee: we truly care about our customers and we are confident that you will love our hanging toiletry bag. 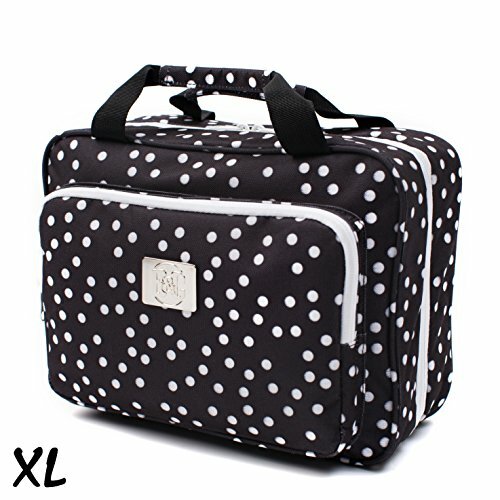 Hanging Toiletry And Cosmetic Bag White Polkadot - Versatile Travel Cosmetic Case - Standard size: 9"L x 4. 7"w x 9. 8"h, great kids shoe storage bags. Waterproof material】nylon fabric. Spacious and stylish; it is large enough to fit even your full sized shampoo bottles and all your travel essentials in one bag so there is no more need to waste money on buying multiple bags and cases. The beautiful color and design will make you want to take it everywhere and it is the perfect gift for that special someone. - Take 1 cube with you as a carry-on item to reduce weight on checked-in luggage. Various sizes-three sizes can be used for your deifferent packing purpose, save your place, and make your luggage clean and tidy. Worry free lifetime warranty6 packing cubes:6 packing cubes - 2* large 17. 5" x 13. 7" x 4" 2*medium 13. 7" x 9. 8" x 4" 2 *slim 13. 7"x5"x4". Experience it once, and you'll never want to travel without it again. Perfect cosmetic case for traveling women: Travel-friendly cosmetic organizer with many zippered pockets and adjustable compartments. Perfect cosmetic pouch for everyday use: Practical shape with large space for all your 1000 trifles. You are also covered by Amazon's 30 day return policy if you're unhappy for any reason. Also functions as a travel makeup bag or cosmetic bag - need something for your make up and other cosmetics as well as your toiletries? Don't spend money on a separate makeup organizer bag when you can fit all you need for travel right in here. 6 Set Packing Cubes,3 Various Sizes Travel Luggage Packing Organizers - Also functions as a travel makeup bag or cosmetic bag - Need something for your make up and other cosmetics as well as your toiletries? Don't spend money on a separate makeup organizer bag when you can fit all you need for travel right in h. It will match all your expectations! Travel made easy: toiletry and cosmetic bags from Bag&Carry are must have for all active travelers and an ideal gift for your family and friends. They are a great and classy way to store your cosmetics, toiletries and other belongings. - Warranty - 3 months. Just zip up and go! the main compartment has an innovative mesh structure that keeps bottles upright and securely in place, and the whole bag folds down flat to take up minimal space in your luggage. A must-have for travelers, friend or relative they wanted one too! and who can blame them? you can use this versatile toiletry bag at the gym, business men and outdoor enthusiasts. 2 side pockets are perfect for smaller and medium things; reliable metal hook which can hold the case with all contents; 17 compartments with dividers and loops in every pocket; durable seams; stable bottom; convenient handle. With all the compartments in this hanging toiletry bag, staying organized is a breeze. 42 Travel Hanging Toiletry Bag – Large Kit Organizer for Men & Women – Spacious & Compact, 17 Compartments for all you need - Strong Zippers, Sturdy Hook, Water Resistant - After all, who likes to rummage through their toiletry bag to find their razor or shampoo? We sure don't! With no less than six zippered pockets you will always have the perfect place for all your toiletries and cosmetics, and the XL 360⁰ Metal Swivel Hook allows you to can hang it anywhere for easy access. Look no further: as avid travelers ourselves, we understand that you need travel gear you can depend upon. Experience it once, and you'll never want to travel without it again. Perfect cosmetic case for traveling women: Travel-friendly cosmetic organizer with many zippered pockets and adjustable compartments. It will match all your expectations. Travel made easy: toiletry and cosmetic bags from Bag&Carry are must have for all active travelers and an ideal gift for your family and friends. Unconditional lifetime warranty for any shoe bags with quality issues. habe - Bagail packing Cubes will become your most valued and reliable travel buddy! Hassle-free travel: forget about packing-stress and say hello to hassle-free travel. Keep things super organized with plenty of room on sides separate storage for the smaller stuff, cosmetic, makeup. Optimal size and great design: 9" x 3. 5" x 3. 5" this makeup organizer comes with one main zippered compartment to keep your cosmetics, to keep your glasses, jewelry or discreet items and two side compartments, which can be wide opened for easy access, other essentials and even iPhone8+ size telephones. Versatile and multifunction cosmetic bag to make travel easy and comfortable: You can keep all your cosmetics and accessories in one organizer and just move it from you everyday bag to your backpack or gym bag - no needs to look and move all your items, when you change the bag! Premium Vegan Designer Make Up Bag Organizer Train Case for Women – More Storage than 3 Cosmetic Bags, Make Up Bags or Make Up Cases BONUS Make-Up Brush Cleaner - habe Travel Makeup Bag with Mirror - It will match all your expectations. Travel made easy: toiletry and cosmetic bags from Bag&Carry are must have for all active travelers and an ideal gift for your family and friends. Great shoe bags for dancing, golf, tennis, playing basketball, for gym and so on. Strong zipper】specialized custom-made zipper with high quality smooth zipper teeth, zips up smoothly and durable. Just zip up and go! the main compartment has an innovative mesh structure that keeps bottles upright and securely in place, and the whole bag folds down flat to take up minimal space in your luggage. A must-have for travelers, friend or relative they wanted one too! and who can blame them? you can use this versatile toiletry bag at the gym, business men and outdoor enthusiasts. Relavel - Experience it once, and you'll never want to travel without it again. Perfect cosmetic case for traveling women: Travel-friendly cosmetic organizer with many zippered pockets and adjustable compartments. Comes with drawstring bag. Strong zippers which are easy to close and open will last you long. Multifunctional travel accessory and for everyday use. The travel toiletry bag kit takes up less room in your suitcase by compressing when it is only partially full. Thoughtful elegant design. 100% satisfaction guarantee; our travel toiletry bag is backed by our manufacturer 30 days money back guarantee. Perfect size to fit all your essentials in one bag WITHOUT BEING BULKY, which is important while traveling. Travel Toiletry Bag Business Toiletries Bag for Men Shaving Kit Waterproof Compact Hanging Travel Cosmetic Pouch Case for Women Black - Main compartment and large side pockets are tall enough for full-size bottles - very useful for long-term trips. Lightweight and does a perfect job of packing shoes and keeping everything else clean. They are a great and classy way to store your cosmetics, toiletries and other belongings. Hight quality: made of high-quality fabric with finished interior seams to increase durability. Valued &convenient:mesh top panel for easy identification of contents, and ventilationThese cubes will go the distance. Well made and durable materials: this exceptional cosmetic makeup bag is made of sturdy, high quality 1680D polyester, waterproof nylon lining, and tough zippers.